SCHULTZE GETS THE BLUES is one of the most unusual films you will ever see. The pacing is extremely slow, the dialogue almost non-existant and the overall style is so understated you will initially find yourself asking, "What's the point?" Some things just take a little extra time before they succeed in taking you in, and first-time Writer/Director Michael Schorr makes a remarkably impressive debut in this unforgettable character study of an aging man who is forced into early retirement. Horst Krause plays the title character, and his droll, deadpan performance will definitely win you over if given the chance. This is a film about loneliness, boredom and the healing power of music. 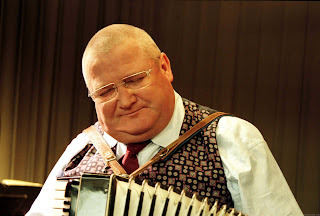 In this case it's good ol' zydeco music that captures the imagination and the dying spirit of an amateur German accordion player with little to live for now that he's saddled with nothing but free time on his hands. As Schorr so poignantly points out, retirement often is a dead end road with nothing to offer along the way. This is especially true if you have been working in a salt mine, literally, all of your life. Schultze may have failed to take the stage in New Braunfels, but he succeeds in sailing to Cajun country where, ultimately, his journey (secular and spiritual) takes a surprising turn. 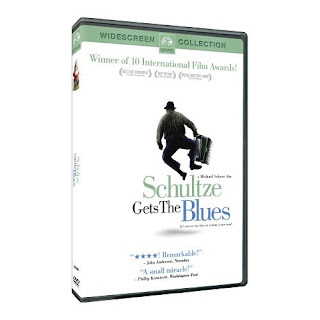 As I previously indicated, SCHULTZE GETS THE BLUES is a very unique viewing experience. Like the blues, this is a film you will "feel" first and find meaning later. Maybe much later. But it will come...and you will get the point. (For another example of mise en scene filmmaking I refer the reader to Otto Preminger's HURRY SUNDOWN (1967). What Mr. Preminger is able to convey within each wide-angle shot is amazing. You owe it to yourself to see what I mean).